1 Firm Block of Tofu, drained and excess water removed. 4-5 tbs of Olive Oil. First prepare your chips, wash, then cut the potatoes into chip shapes of your choice, I like chunky chips & I also leave the skin on. But its up to you if you want to peel them or not. Place in a non-stick baking tray and drizzle over some olive oil, sprinkling of salt, pepper & plain flour plus the sprigs of thyme then bake for around 25-30 or until golden and crispy. 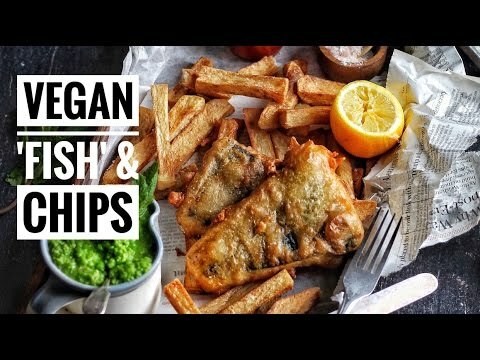 You can deep fry your chips instead, however baking is obviously a lot healthier. Pour the sunflower oil into a large saucepan or deep fat fryer. If using a saucepan only fill the saucepan half way full, to prevent it over flowing when you put the fish in. Whilst your chips are cooking, its time to make the fish element. Cut the tofu block into rectangles or fillet shapes, what ever you feel more confident doing. Using scissors cut the nori sheet into pieces the same size as the tofu fillets. Lay the Nori onto the fillet (this resembles fish skin & also has a great taste of the sea flavour) and squeeze over some of the lemon juice to help it stick. Set aside while you quickly whisk up your beer batter. Combine the dry ingredients in a mixing bowl, then pour in the beer & water. Mix until it forms a thick batter. At this point your oil should be hot enough, if using a deep fryer 180 degrees should be fine, if doing it in saucepan as soon as you see a light haze coming off the top of the oil it will be hot enough, you can always test the heat using a cube of bread. Drop the bread into the oil, and if its floats to the top quickly and turns golden, your oil is hot enough. Dip the Nori lined tofu into the batter individually and then into the oil very carefully. Cook until the batter is golden. Then place on kitchen paper to drain off excess oil and sprinkle with salt. Remove the chips from the oven and serve with the Tofu fish, and traditional sauces. Special Thanks to Gaz Oakley for the recipe.